After a hard-fought Wild Card and Divisional Weekend, Conference Championships begin on Sunday, January 20th. The NFC Championship takes place 3:05 EST on FOX between the Los Angeles Rams and the New Orleans Saints in the Superdome. The AFC championship takes place later on Sunday, 6:40 on CBS between the New England Patriots and Kansas City Chiefs in Arrowhead Stadium. Conference Championship weekend is destined for greatness. The top 4 offenses in the NFL are the remaining 4 teams averaging 31.7 points per game, but it’s also notable that 3 of the 4 have top-10 ranked offensive lines over the season, and none of them are in the bottom half of the league. If you like offensive stardom, buckle your seat belt because it’s going to be a wild ride this weekend. The Chiefs, Patriots, Rams, and Saints excel in getting playmakers in space and creating mismatches for opposing defenses, setting the stage for two shootouts in the Championship games. All of the four excellent teams remaining in the Lombardi hunt have respectively played their matchup in the 2018 regular season, and they certainly didn’t disappoint. The New Orleans Saints defeated the Los Angles Rams 45-35 on November 4th in an offensive shootout. Drew Brees and Jared Goff combined for 737 passing yards and 7 TDs. Micheal Thomas, who had a monster game against the Eagles in the divisional round, also feasted vs the Rams in week 9, going for 12 receptions for 211 yards and a TD. The New England Patriots took down the then-undefeated Kansas City Chiefs Week 6 in Gillette Stadium. The final score read 43-40 Patriots. Patrick Mahomes II and Tom Brady combined for 692 passing yards and 5 TDs. Tyreek Hill aka “The Cheetah” was the surefire X-factor in the game, exploding for 142 yards and 3 TD’s on 7 receptions despite the loss. New Orleans Saints QB Drew Brees truly ages like a fine wine. A top candidate in the MVP race, Brees recorded a ridiculous 82.2 % adjusted completion percentage, #1 in the NFL. Although a strong unit, the Rams defense is capable of being carved up. Saints All-Pro WR Micheal Thomas is no stranger to having monster games against the Rams. This season, Thomas graded as Pro Football Focuses (PFF) 2nd best receiver recording a 91.6 grade. He leads the NFL in yards per route run (2.6) and slot yards per route run (3.63). The Saints contain the most dynamic backfield in the NFL spearheaded by Alvin Kamara and Mark Ingram II. Get used to hearing Brees and Thomas heavily throughout the game, as they are the key for a Saints Super Bowl run. Not too long ago Rams RB Todd Gurley was in the lead for league MVP honors before an injury in week 15. Gurley along with recent signee CJ Anderson exploded last week against the Dallas Cowboys who were top 10 in stopping the run. Anderson carried 23 times for 123 yards and 2 TD along with Gurley’s 115 yards and TD on 16 touches. The Rams have to establish Gurley and Anderson in order to upset the Saints. It’s a given that Rams QB Jared Goff and his WR’s Robert Woods and Brandin Cooks will produce big numbers. Rams DT Aaron Donald is arguably the most disruptive defensive lineman the NFL has seen in years, leading defensive tackles in every major category. Another stellar performance from Donald and the Rams running game will propel Los Angeles to its first Super Bowl since 2000. The National Weather Service is projecting an Arctic blast to settle over Kansas City for Sunday’s AFC Championship Game vs Patriots, reports the AP. The temperature at kickoff could range from 10 degrees to well below zero, making it the coldest game in Arrowhead Stadium history. The weather will likely impact the Chiefs down-field passing game the most, although I believe it will have little impact on the game. Likely league MVP Patrick Mahomes II recorded an astronomical 134.2 passer rating (out of 158.3) from a clean pocket this season. The Patriots have one of the weaker pass rushes in the NFL, setting up Mahomes for a massive day. If Patrick Mahomes is kept clean for most of the day, it will require a Hall of Fame performance from Brady and Bellicheck to beat Kansas City at home. Tom Brady is 24-4 in temperatures below 30 degrees: “my mind doesn’t slow down in the cold, but their bodies do,” per @jayfeely. Watch out for Patriots RB James White coming off of a 15 catch divisional round performance against the Los Angeles Chargers. The all-anticipated Super Bowl takes place after Pro Bowl Week, in Mercedes-Benz Stadium in Atlanta, GA February 3rd 6:30 on CBS. 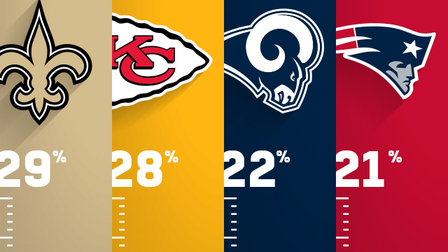 According to PFF, the most likely Super Bowl matchups follow as Saints vs Chiefs, Saints vs Patriots, Rams vs Chiefs, and Rams vs Patriots.